Black is back this season. The overall length of this very long necklace is 46" (shortened for display purposes).It is made up of gold filled(hard wearing)very fine chain, 16" of this necklace is made up of jet black swarovski 4mm faceted beads.These swarovski beads are interspersed with graduated deep red/brown wooden beads. these wooden beads perfectly compliment the focal point of a 2" deep(two and a half inch wide)real maple leaf which has been coated in copper metal making it very strong. The warm colour coating shows the true beauty of this leaf, losing no detail.The leaf, along with the faceted swarovski beads really catch the light making this necklace an ideal accessory for a winter evening and also this seasons trend of metallics. 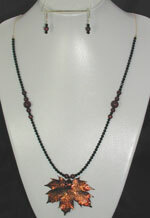 Also with this unique necklace you will receive drop earrings made of matching swarovski and wooden beads.